Capturing a Before and After Performance Report for Windows Servers. The current project I’m on has a requirement for being able to determine a server’s overall performance before and after a migration, mostly to make sure that it still functions the same or better once its on the new platform. Whilst it’s easy enough to get raw statistics from perfmon getting an at-a-glance view of how a server is performing before and after a migration is a far more nuanced concept, one that’s not easily accomplished with some Excel wizardry. With that in mind I thought I’d share with you my idea for creating such a view as well as outlining the challenges I’ve hit when attempting to collate the data. Essentially these metrics can be broken down into 3 categories: quantitative, qualitative and qualifying. Quantitative metrics are the base metrics which will form the main part of the before and after analysis. Qualitative metrics are mostly just informational (being the Top 5 consumers of X resource) however they’ll provide some useful insight into what might be causing an issue. For example if an SQL box isn’t showing the SQL process as a top consumer then it’s likely something is causing that process to take a dive before it can actually use any resources. Finally the qualifying metrics are used to indicate whether or not increased usage of a certain metric signals an impact to the server’s performance like say if the memory usage is high and the memory balloon size is high it’s quite likely the system isn’t performing very well. The vast majority of these metrics are provided in perfmon however there were a couple that I couldn’t seem to get through the counters, even though I could see them in Resource Monitor. As it turns out Resource Monitor makes use of the Event Tracing for Windows (ETW) framework which gives you an incredibly granular view of all events that are happening on your machine. What I was looking for was a breakdown of disk and network usage per process (in order to generate the Top 5 users list) which is unfortunately bundled up in the IO counters available in perfmon. In order to split these out you have to run a Kernel Trace through ETW and then parse the resulting file to get the metrics you want. It’s a little messy but unfortunately there’s no good way to get those metrics separated. The resulting perfmon profile I created can be downloaded here. The next issue I’ve run into is getting the data into a readily digestible format. You see not all servers are built the same and not all of them run the same amount of software. This means that when you open up the resulting CSV file from different servers the column headers won’t line up so you’ve got to either do some tricky Excel work (which is often prone to failure) or get freaky with some PowerShell (which is messy and complicated). I decided to go for the latter as at least I could maintain and extend the script somewhat easily whereas an Excel spreadsheet has a tendency to get out of control faster than anyone expects. That part is still a work in progress however but I’ll endeavour to update this post with the completed script once I’ve got it working. 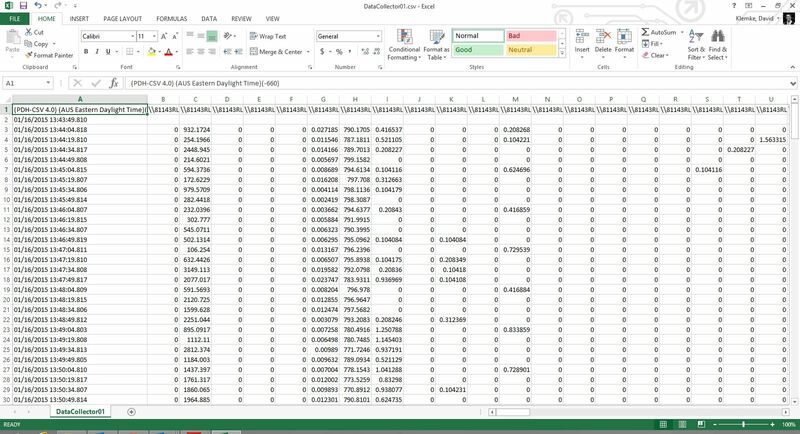 After that point it’s a relatively simple task of displaying everything in a nicely formatted Excel spreadsheet and doing comparisons based on the metrics you’ve generated. If I had more time on my hands I probably would’ve tried to integrate it into something like a SharePoint BI site so we could do some groovy tracking and intelligence on it but due to tight time constraints I probably won’t get that far. Still a well laid out spreadsheet isn’t a bad format for presenting such information, especially when you can colour everything green when things are going right. 10,000 Hours of Deliberate Practice: A Necessary but not Sufficient Condition for Mastery. It’s been almost 6 years since I first began writing this blog. If you dare to troll through the early archives there’s no doubt that the writing in there is of lower quality, much of it to do with me still trying to find my voice in this medium. Now, some 1300+ posts later, the hours I’ve invested in developing this blog my writing has improved dramatically and every day I feel far more confident in my abilities to churn out a blog post that meets a certain quality threshold. I attribute much of that to my dedication to writing at least once a day, an activity which has seen me invest thousands of hours into improving my craft. Indeed I felt that this was something of an embodiment of the 10,000 hour rule at work, something that newly released research says isn’t the main factor at play. The study conducted by researchers at Princeton University (full text available here) attempted to discern just how much of an impact deliberate practice had on performance. They conducted a meta analysis of 150 studies that investigated the relationship between these two variables and classified them along major domains as well as the methodology used to gather performance data. The results show that whilst deliberate practice can improve your performance within a certain domain (and which domain its in has a huge effect on how great the improvement is) it’s not the major contributor in any case. Indeed the vast majority of improvements are due to factors that reside outside of deliberate practice which seemingly throws the idea of 10,000 hours worth of practice being the key component to mastering something. To be clear though the research doesn’t mean that practice is worthless, indeed in pretty much every study conducted there’s a strong correlation between increased performance and deliberate practice. What this study does show though is that there are factors outside of deliberate practice which have a greater influence on whether or not your performance improves. Unfortunately determining what those factors are was out of the scope of the study (it’s only addressed in passing in the final closing statements of the report) but there are still some interesting conclusions to be made about how one can go about improving themselves. Where deliberate practice does seem to help with performance is with activities that have a predictable outcome. Indeed performances for routine activities show a drastic improvement when deliberate practice is undertaken whilst unpredictable things, like aviation emergencies, show less improvement. We also seem to overestimate our own improvement due to practice alone as studies that relied on people remembering past performances showed a much larger improvement than studies that logged performances over time. Additionally for the areas which showed the least amount of improvement due to deliberate practice it’s likely that there’s no good definition for “practice” within these domains, meaning it’s much harder to quantify what needs to be practiced. So where does this leave us? Are we all doomed to be good at only the things which our nature defines for us, never to be able to improve on anything? As far as the research shows no, deliberate practice might not be the magic cure all for improving but it is a great place to start. What we need to know now is what other factors play into improving performances within their specific domains. For some areas this is already well defined (I can think of many examples in games) but for other domains that are slightly more nebulous in nature it’s entirely possible that we’ll never figure out the magic formula. Still at least now you don’t worry so much about the hours you put in, as long as you still, in fact, put them in. Samsung’s V-NAND Has Arrived, and It’s Awesome. When people ask me what one component on their PC they should upgrade my answer is always the same: get yourself a SSD. It’s not so much the raw performance characteristics that make the upgrade worth it, more all those things that many people hate about computers seem to melt away when you have a SSD behind it. All your applications load near instantly, your operating system feels more responsive and those random long lock ups where your hard drive seems to churn over for ages simply disappears. However the one drawback is their size and cost, being an order of magnitude above the good old spinning rust. Last year Samsung announced their plans to change that with V-NAND and today they deliver on that promise. 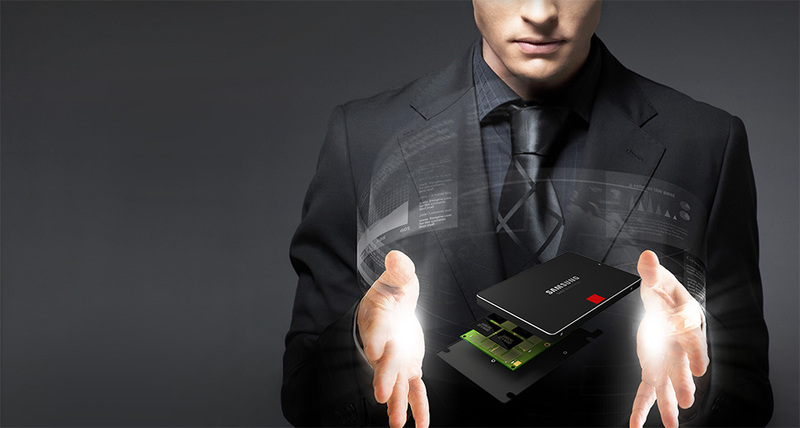 The Samsung 850 Pro is the first consumer drive to be released with V-NAND technology and is available in sizes up to 1TB. The initial promise of 128Gbit per chip has unfortunately fallen a little short of its mark with this current production version only delivering around 86Gbit per chip. This is probably due to economical reasons as the new chips under the hood of this SSD are smaller than the first prototypes which helps to increase the yield per wafer. Interestingly enough these chips are being produced on an older lithography process, 30nm instead of the current standard 20nm for most NAND chips. That might sound like a step back, and indeed it would be for most hardware, however the performance of the drive is pretty phenomenal, meaning that V-NAND is going to get even better with time. Looking at the performance reviews the Samsung 850 Pro seems to be a top contender, if not the best, in pretty much all of the categories. In the world of SSDs having consistently high performance like this across a lot of categories is very unusual as typically a drive manufacturer will tune performance to a certain profile. Some favour random reads, others sustained write performance, but the Samsung 850 Pro seems to do pretty much all of them without breaking a sweat. However what really impressed me about the drive wasn’t so much the raw numbers, it was how the drive performed over time, even without the use of TRIM. SSDs naturally degrade in performance over time, not due to the components wearing out but due to the nature of how they read and write data. Essentially it comes down to blocks needing to be checked to see if they’re free or not before they can be written to, a rather costly process. A new drive has all blank space which means these checks don’t need to be done but over time they’ll get into unknown states due to all the writing and rewriting. The TRIM command tells SSDs that certain blocks have been freed up, allowing the drive to flag them as unused, recovering some of the performance. The graph above shows what happens when the new Samsung 850 Pro reaches that performance degradation point even without the use of TRIM. If you compare that to other SSDs this kind of consistent performance almost looks like witchcraft but it’s just the V-NAND technology showing one of its many benefits. Indeed Samsung is so confident in these new drives it’s giving all of them a 10 year warranty, something you can’t find even on good old spinning rust drives anymore. I’ll be honest when I first read about V-NAND I had a feeling that the first drives would likely be failure ridden write offs, like most new technologies are. However this new drive from Samsung appears to be the evolutionary step that all SSDs need to take as this first iteration device is just walking all over the competition. I was already sold on a Samsung SSD for my next PC build but I think an 850 Pro just made the top of my list. Now if only those G-SYNC monitors could come out already, then I’d be set to build my next gen gaming PC. 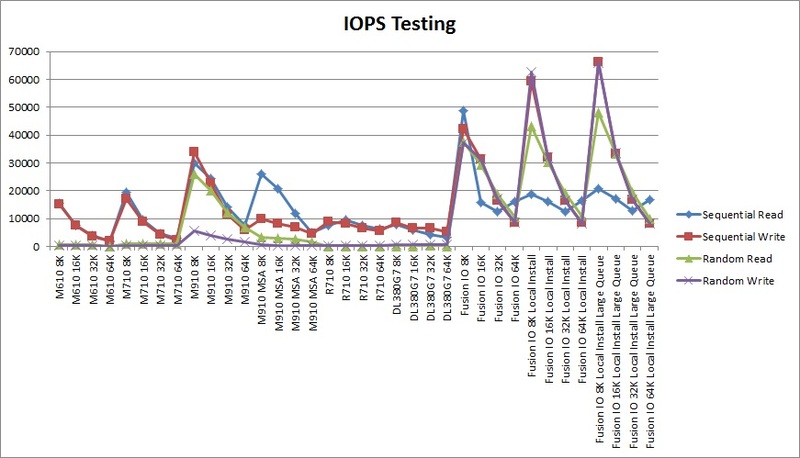 Virtual Machine CPU Over-provisioning: Results From The Real World. Back when virtualization was just starting to make headway into the corporate IT market the main aim of the game was consolidation. Vast quantities of CPU, memory and disk resources were being squandered as servers sat idle for the vast majority of their lives, barely ever using the capacity that was assigned to them. Virtualization allowed IT shops the ability to run many low resource servers on the one box, significantly reducing the hardware requirement cost whilst providing a whole host of other features. It followed then that administrators looked towards over-provisioning their hosts, I.E. creating more virtual machines than the host was technically capable of handling. The reason this works is because of a feature of virtualization platforms called scheduling. In essence when you put a virtual machine on an over-provisioned host it will not be guaranteed to get resources when it needs them, instead it’s scheduled on and in order to keep it and all the other virtual machines running properly. Surprisingly this works quite well as for the most part virtual machines spend a good part of their life idle and the virtualization platform uses this information to schedule busy machines ahead of idle ones. Recently I was approached to find out what the limits were of a new piece of hardware that we had procured and I’ve discovered some rather interesting results. The piece of kit in question is a Dell M610x blade server with the accompanying chassis and interconnects. 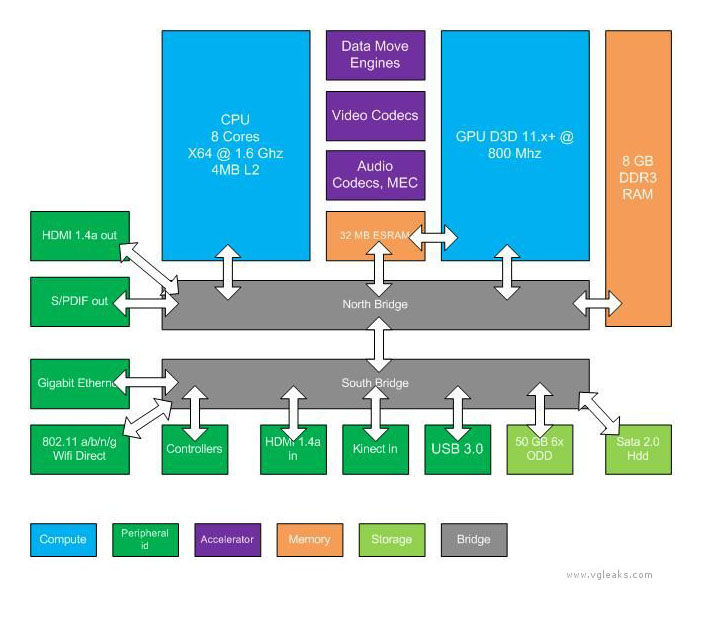 The specifications we got were pretty good being a dual processor arrangement (2 x Intel Xeon X5660) with 96GB of memory. What we were trying to find out was what kind of guidelines should we have around how many virtual machines could comfortably run on such hardware before performance started to degrade. There was no such testing done with previous hardware so I was working in the dark on this one, so I’ve devised my own test methodology in order to figure out the upper limits of over-provisioning in a virtual world. The primary performance bottleneck for any virtual environment is the disk subsystem. You can have the fastest CPUs and oodles of RAM and still get torn down by slow disk. However most virtual hosts will use some form of shared storage so testing that is out of the equation. The two primary resources we’re left with then are CPU and memory and the latter is already a well known problem space. However I wasn’t able to find any good articles on CPU over-provisioning so I devised some simple tests to see how the systems would perform when under a load that was well above its capabilities. The first test was a simple baseline, since the server has 12 available physical cores (HyperThreading might say you get another core, but that’s a pipe dream) I created 12 virtual machines each with a single core. I then fully loaded the CPUs to max capacity. Shown below is a stacked graph of each virtual machine’s ready time which is a representation of how long the virtual machine was ready¹ to execute some instruction but was not able to get scheduled onto the CPU. 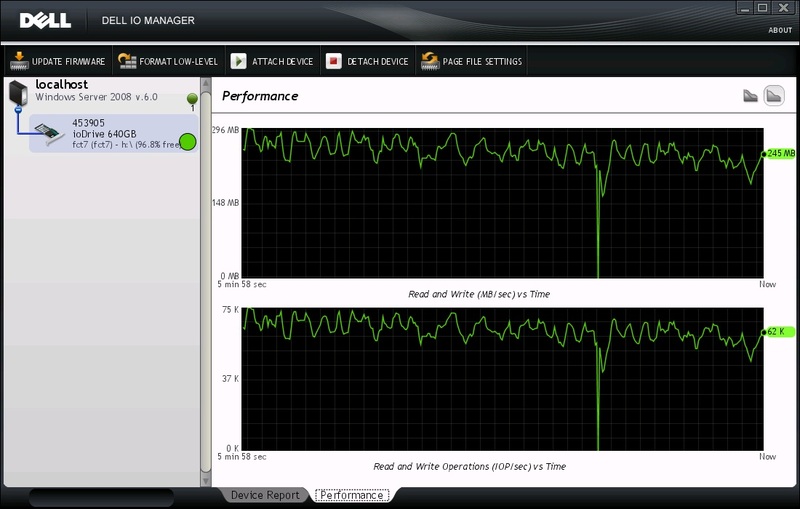 The initial part of this graph shows the machines all at idle. Now you’d think at that stage that their ready times would be zero since there’s no load on the server. However since VMware’s hypervisor knows when a virtual machine is idle it won’t schedule it on as often as the idle loops are simply wasted CPU cycles. The jumpy period after that is when I was starting up a couple virtual machines at a time and as you can see those virtual machine’s ready times drop to 0. The very last part of the graph shows the ready time rocketing down to nothing for all the virtual machines with the top grey part of the graph being the ready time of the hypervisor itself. This test doesn’t show anything revolutionary as this is pretty much the expected behaviour of a virtualized system. It does however provide us with a solid baseline from which we can draw some conclusions from further tests. The next test I performed was to see what would happen when I doubled the work load on the server, increasing the virtual core count from 12 to a whopping 24. For comparison’s sake the first graph’s peak is equivalent to the first peak of the second graph. What this shows is that when the CPU is oversubscribed by 100% the CPU wait times rocket through the roof with the virtual machines waiting up to 10 seconds in some cases to get scheduled back onto the CPU. The average was somewhere around half a second which for most applications is an unacceptable amount of time. Just imagine trying to use your desktop and having it freeze for half a second every 20 seconds or so, you’d say it was unusable. Taking this into consideration we now know that there must be some level of happy medium in the centre. The next test then aimed right bang in the middle of these two extremes, putting 18 CPUs on a 12 core host. Here’s where it gets interesting. The graph depicts the same test running over the entire time but as you can see there are very distinct sections depicting what I call different modes of operation. The lower end of the graph shows a time when the scheduler is hitting bang on its scheduling and the wait times are overall quite low. The second is when the scheduler gives much more priority to the virtual machines that are thrashing their cores and the machines that aren’t doing anything get pushed to the side. However in both instances the 18 cores running are able to get the serviced in a maximum of 20 milliseconds or so, well within the acceptable range of most programs and user experience guidelines. Taking this all into consideration it’s then reasonable to say that the maximum you can oversubscribe a virtual host in regards to CPU is 1.5 times the number of physical cores. You can extrapolate that further by taking into consideration the average load and if it’s below 100% constantly then you can divide the number of CPUs by that percentage. For example if the average load of these virtual machines was 50% then theoretically you could support 36 single core virtual machines on this particular host. Of course once you get into the very high CPU count things like overhead start to come into consideration, but as a hard and fast rule it works quite well. If I’m honest I was quite surprised with these results as I thought once I put a single extra thrashing virtual machine on the server it’d fall over in a screaming heap with the additional load. It seems though that VMware’s scheduler is smart enough to be able to service a load much higher than what the server should be capable of without affecting the other virtual machines that adversely. This is especially good news for virtual desktop deployments as typically the limiting factor there was the number of CPU cores available. If you’re an administrator of a virtual deployment I hope you found this informative and it will help you when planning future virtual deployments. ¹CPU ready time was chosen as the metric as it most aptly showcases a server’s ability to serve a virtual machine’s request of the CPU when in a heavy scheduling scenario. Usage wouldn’t be an accurate metric to use since for all these tests the blade was 100% utilized no matter the number of virtual machines running. A SSD By Any Other Synthetic Benchmark Would Be As Fast. Like any technology geek real world performance of a component is the most important aspect for me when I’m looking to purchase new hardware. Everyone knows manufacturer’s can’t be trusted with ratings, especially when they come up with their own systems that provide big numbers that mean absolutely nothing, so I primarily base my purchasing decisions based on aggregating reviews from various sources around the Internet in order to get a clear picture of which brand/revision I should get. After that point I usually go for the best performance per dollar as whilst it’s always nice to have the best components the price differential is usually not worth the leap, mostly because you won’t notice the incremental increase. There are of course notable exceptions to this hard and fast rule and realistically my decision in the end wasn’t driven by rational thought so much as it was pure geeky lust after the highest theoretical performance. Solid State Drives present quite an interesting value proposition for us consumers. They are leaps and bounds faster than their magnetic predecessors thanks to their ability to access data instantaneously and their extremely high throughput rates. Indeed with the hard drive being the bottleneck of performance for nearly every computer in the world the most effective upgrade you can get is that of a SSD. Of course nothing can beat magnetic hard drives for their cost, durability and capacity so it’s very unlikely that we’ll be seeing the end of them anytime soon. Still the enormous gap that separates SSDs from any other storage medium brings about some interesting issues of its own: benchmarks, especially synthetic ones, are almost meaningless for end users. I’ll admit I was struck by geek lust when I saw the performance specs for the OCZ Vertex 3, they were just simply amazing. Indeed the drive has matched up to my sky high expectations with me being able to boot, login and open up all my applications in the time it took my previous PC just to get to the login screen. Since then I’ve been recommending the Vertex 3 to anyone who was looking to get a new drive but just recently OCZ announced their new budget line of SSDs, the Agility 3. Being almost $100 cheaper and sporting very similar performance specs to that of the Vertex it’s a hard thing to argue against especially when you consider just how fast these SSDs are in the first place. Looking at the raw figures it would seem like the Agility series are around 10% slower than their Vertex counterparts on average, which isn’t bad for a budget line. However when you consider that the 10% performance gap is the difference between your windows loading in 6.3 seconds rather than 7 and your applications launching in 0.9 seconds instead of 1 then the gap doesn’t seem all that big. Indeed I’d challenge anyone to be able to spot the differences between two identical systems configured with different SSDs as these kinds of performance differences will only matter to benchmarkers and people building high traffic systems. Indeed one of my mates had been running a SSD for well over a year and a half before I got mine and from what he tells me the performance of units back then was enough for him to not notice any slow down after not formatting for that entire time. Likely then if you’re considering getting a SSD but are turned off by the high price of current models you’ll be quite happy with the previous generation as the perceived performance will be identical. Although with the Agility 3 120GB version going for a mere $250 the price difference between generations isn’t really that much anymore. Realistically SSDs are just the most prominent example of why synthetic benchmarks aren’t a good indicator of real world performance. There’s almost always an option that will provide similar performance for a drastically reduced price and for the end user the difference will likely be unnoticeable. SSDs are just so far away from their predecessors that the differentials between the low and high end are usually not worth mentioning, especially if you’re upgrading from good old spinning rust. Of course there will always be geeks like me whose lust will overcome their sensibility and reach for the ultimate in performance, which is why those high end products still exist today.